Mumbai: After watching 2008: the sequel yesterday, markets are taking a breather. The rating agency Standard & Poor’s made a statement that it had not cut France’s debt rating, Italian bond yields that had topped 7% levels also declined and Greece finally named a new prime minister. Things started improving in Italy as well, after a successful auction of debt securities at a higher rate compared to the last time. On Thursday, Italy was able to raise $6.8 billion Euros from the auction of one year debt paper, paying an average rate of 6.09% interest, its highest since 1997. Markets also cheered the news that former European Commissioner, Mario Monti, led by a cabinet of technocrats will succeed Prime Minister Silvio Berlusconi in Italy as soon as parliament passes the austerity measures which are demanded by the European Union. While positives outweigh the negatives, problems in Europe are far from over as the European Union warned of deep recession after cutting the growth forecast of the 27-nation block to just 0.6% from 1.8% six months ago. Additionally, analysts warn that this is just a sentiment-based rebound and not a real solution since the European Central Bank is just absorbing the problems. In the US, markets recouped some of the losses made on Wednesday following positive news from the Euro zone as well as news that jobless claims also fell to seven month low domestically. In Asia too, markets crawled upwards in opening trades tracking firm cues from Wall Street. Financials were leading the gains as Japan’s Nikkei Stock Average added 0.3%, Hang Index which was hammered by over 5% on Thursday climbed 1% and China’s Shanghai Composite advanced 0.4%. Back in India, religious holiday Gurunanak Jayanti saved the Indian bourses from a knee-jerk reaction. However markets may play catch up in opening trades. 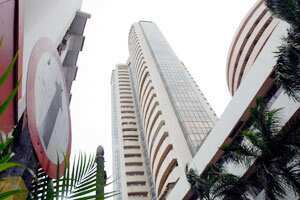 Nifty futures on the Singapore Exchange were hovering around 5,180 levels at 7:30 hours. Satyam Computer Services will be on the buzzer in trade today after the second quarter profits beat street estimates. The company reported a 5.7% sequential rise in net profit to ₹ 238 crore and net sales surged 10% quarter-on-quarter to ₹ ,578 crore. Net profit zoomed 10 fold from a year earlier helped by exports and depreciating Rupee. Another stock which may react to quarterly results is DLF, India’s largest real estate firm. The consolidated net profit dropped 11 per cent to ₹ 372 crore from ₹ 418 crore in the corresponding period last year. The company said that decline in profit was due to high interest rates, which affected sales. Reliance MediaWorks will be on the radar after it decided to split business into two parts to boost growth. The film exhibition and media services arm of the Anil Ambani-led Reliance Group, has decided to restructure the company into film exhibition and film and media service and is exploring various options. This will allow a strategic investor to invest in a business of choice. The Tata group may be close to announcing a successor. The company is reviving Annual General Managers Meet after a hiatus of more than four years, indicating that the salt to software conglomerate may be close to finalising a successor to Ratan Tata, chairman. Lastly, the date today is 11.11.11 and consumers should be careful not to get carried away by the tricks of marketers who are taking advantage of this daily numbers game. Many firms are taking advantage of this calendar coincidence and drumming up events, promotions and advertisements.